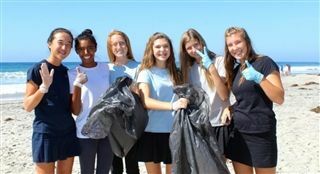 On Wednesday, the entire 9th-grade class participated in a beach cleanup and celebration at Moonlight Beach in Encinitas. The Pacific Ridge Service Learning Program adopted Moonlight Beach through "I Love A Clean San Diego" several years ago, and the afternoon was a great opportunity to honor that commitment while celebrating the end of the first rotation in the year's "Learning Service" program. Students will continue rotating through the program's four dynamic modules - Making a Difference, Social Justice, Design Thinking, and Leadership - throughout the year.